As this is a review of the direct sequel to The Darkness (2007), there are obviously spoilers for that game ahead. You have been warned! Five years after the original game became a sleeper hit on consoles, Jackie Estecado's story finally continues in The Darkness II. Starbreeze Studios, the original developers, were replaced by up and coming Canadian developers Digital Extremes, who had previously worked on a cult-classic console shooter of their own, darkSector. The Darkness II surpasses its predecessor with a smart story, radically improved gameplay and sharp, lightning-quick pacing. 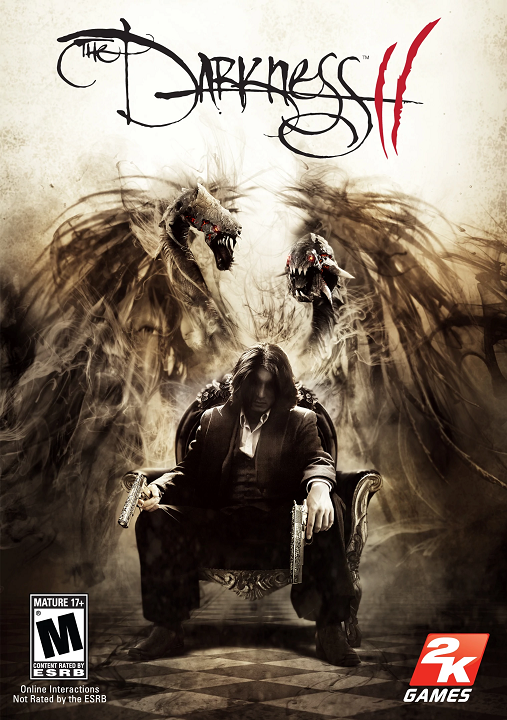 The Darkness II takes place two years after the original. Jackie Estecado has replaced his uncle Paulie as the head of the Franchetti crime family, and during that time has learned to suppress the Darkness. However, after an attempt is made on his life, Jackie is forced to use the Darkness again to heal himself. This sends him down a path of absurd events that make him question his own reality, and without giving too much away, it gets pretty crazy. This pervading surrealism is one of the biggest changes between The Darkness and its sequel. Where the original game stripped down the comic's universe to a setting that could pass for the real word if not for the giant tentacle monster, The Darkness II embraces the more unusual elements of its source material. For example, both the Brotherhood of the Darkness and the Angelus are implemented here from the comics. Jackie also has a much closer relationship to his Darklings; the four background Darklings from the first game are now a single Darkling who helps Jackie throughout the game and even gets his own story arc. As I mentioned in my review of the original game, I am not a fan of The Darkness comics, but Digital Extremes manage to make this transition work. Unlike the comics, or even the first game, The Darkness II is lighter in tone when the story starts to get silly, while still being suitably dramatic where it counts. It also helps that only certain portions of the comics lore are included in this game, while others are modified or reimagined. For example, the Brotherhood of the Darkness maintain their cultish worship of the Darkness entity, but are now villains instead of anti-heroes, as their obssession over a literal personification of shadow has twisted their minds. There's also a new plot device called The Siphon which replaces the thirteen Ancient Artifacts that caused so much story fatigue and confusion in the comics. Then there's the Angelus, which — well, I'll let the players experience that one for themselves. 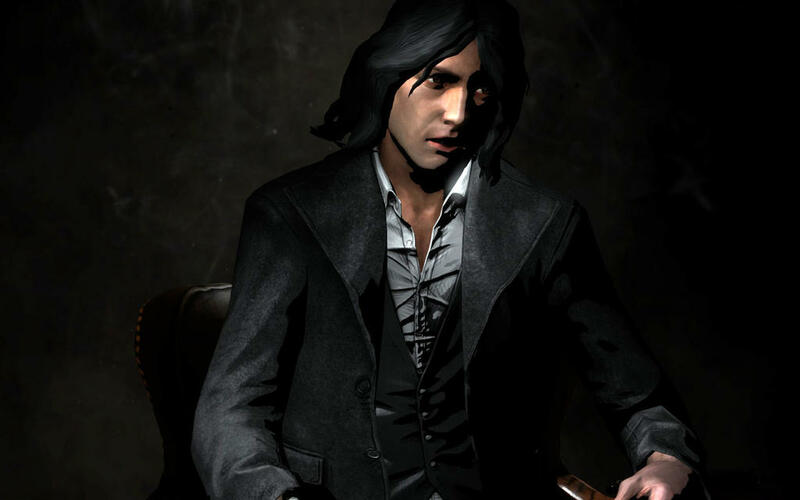 It also helps that The Darkness II creates a brand-new character named Johnny Powell to use for much of these exposition dumps on supernatural lore, and since Johnny is rather, shall we say, unstable, it helps make the player question as much of what Powell as saying as Jackie does. Much like the story, the graphics have undergone a significant change from the first game. 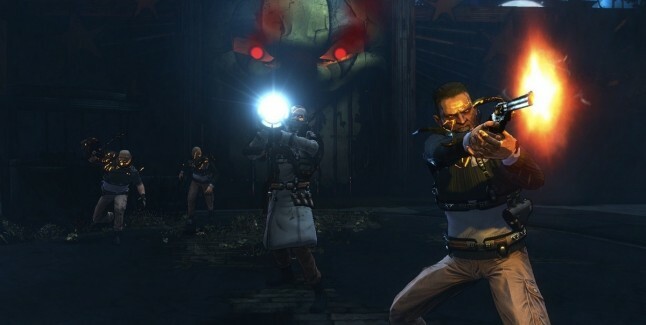 The Darkness II uses cel shading and hand-painted textures to replicate the feel of the comics. In a way, the colour scheme is as monochromatic as the original, but with a brighter palette. Most of the game relies heavily on oranges and reds, while areas with a connection to the Darkness are a sickly black and purple, and a certain location I'm not showing for fear of spoilers is almost blindingly white. The scenery is gorgeous, though humans can sometimes be off-putting, especially if the cel-shading puts a harder emphasis on the black outlines of their charater models. Unfortunately, the original soundtrack by Timothy Michael Wynn is a bit on the generic side, and doesn't have the same kick Gustaf Grefberg's horror rock from the original. To make up for that, The Darkness II has an excellent licensed sountrack that plays from jukeboxes at various points in the game, with artists as diverse as The Flamingos, Jane's Addiction, Ram Jam, and Tone Loc. The voice acting is about on par with the original, even though almost the entire voice cast, save for Mike Patton, has been replaced. The script gives these actors a lot of melodrama to work with, and they chew at the scenery with endearing gusto. That being said, it was particularly sad to see Kirk Acevedo, the original Jackie Estecado, replaced by Nolan North. I love Nolan, he's one of my favourite voice actors working today. But Acevedo was such a natural as Jackie, and anyone, no matter how talented, would have a tough time following in his footsteps, and it's clear that Nolan is trying just a bit too hard to put on a mobster persona that came so naturally to Acevedo. One pleasant surprise was Stefanie Frame, replacing Lauren Ambrose as Jenny. Jenny appears posthumously several times with a, shall we say, very particular role in the story. 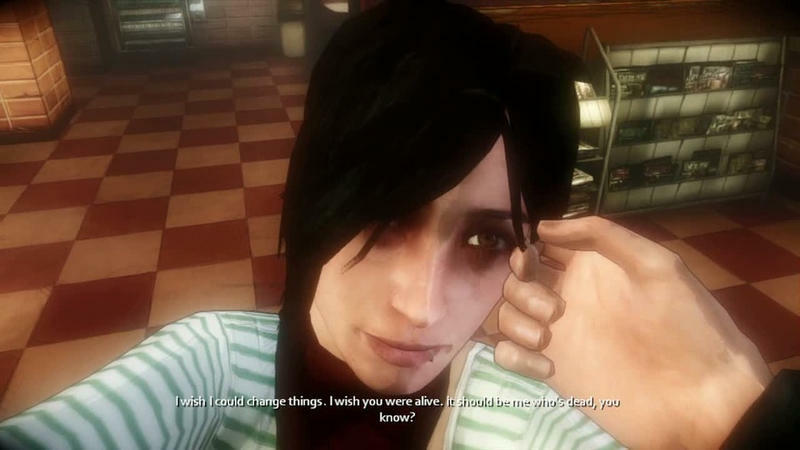 This version of Jenny is an especially tough role, and despite not having the experience of the previous game under her belt, Frame manages to carry what is basically the emotional core of the whole story with incredible ease. Brava, Stefanie! 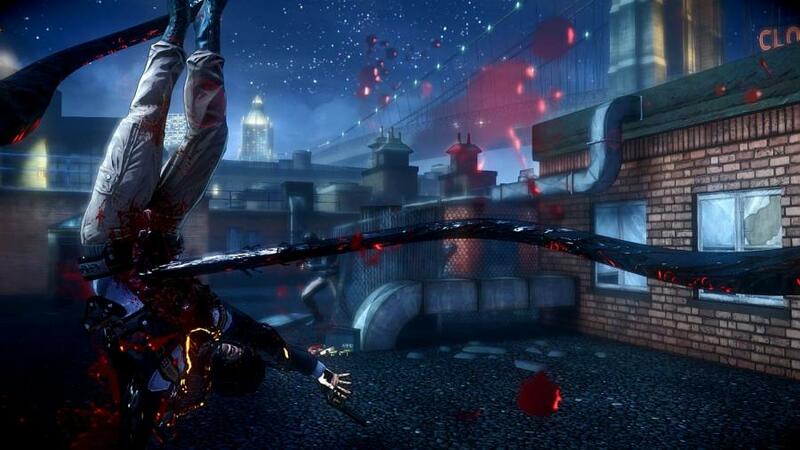 The Darkness II has significantly overhauled the gameplay in every respect. Movement is now faster, with a dedicated sprint button, and actions such as eating enemy hearts and using the Darkness tentacles have much smoother and quicker animations. The control scheme has been completely remapped, with each shoulder button on a controller now representing one gun hand and one Darkness Limb. The Darkness II also has an experience points system, called Essence, which rewards players for creative kills. Essence can then be spent to unlock new abilities like a stun, a charge attack, or my personal favourite, the ability to pick up the Darkling and throw him at enemies. There are even brief sections where players get to control the Darkling directly, which are rather short and do a good job of breaking up the pace. Even though the Darkling's levels are stealth missions, they still manage to be fun because they're quite forgiving — very, very, forgiving. That's not to say there weren't a few small issues, however. 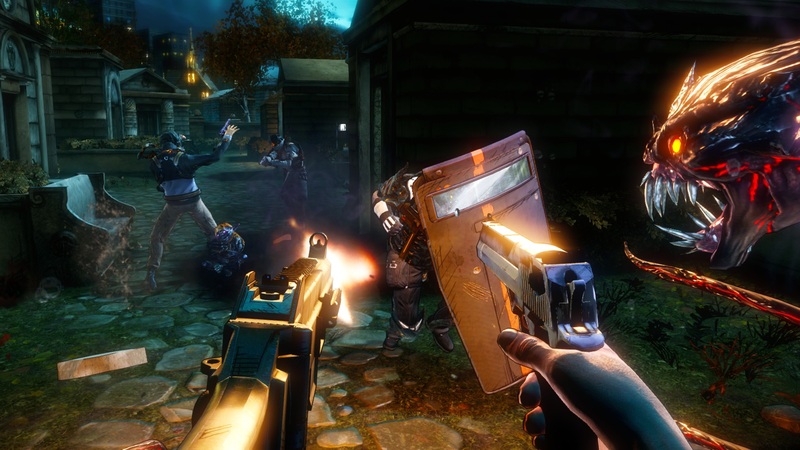 Some mid-game and late-game enemy types feel overpowered, particularly the Brotherhood Whips, who not only wear extra armour, but can use their titular whips to grab Jackie's gun out of his hands with perfect accuracy whenever they feel like it. Also important to mention is the level design. The first Darkness was actually quite linear, but did a good job of hiding it by adding sidequests and making the maps just open enough where it was possible to get lost, tricking players into believing the world was much bigger than it appeared. The Darkness II drops all pretense of openness, sending players down narrow, fully linear levels with no way to backtrack to previous areas. There's also the addition of boss fights, which aren't bad per se, but just feel out of place. Most of these fights are against high-ranking members of the Brotherhood with access to Darkness powers of their own, and are basically teleporting bullet sponges. Also, the very last level in the game felt anticlimactic, with the gameplay just seeming to end mid-objective, though thankfully the final cutscene makes up for it in spades. Overall, The Darkness II is considerably more entertaining to play than the first game. It might be much shorter than the first game, but it's certainly not lacking in depth or replayability. The singleplayer campaign is an absolute blast, and if you're into co-op play, there's a special mode called Vendettas, which is a decent timewaster. There's even a New Game+ for both modes, which I highly recommend, because I'm fairly certain that it is impossible to unlock the entire skill tree on one playthrough. The Darkness II had almost everything going against it from the word go: a new developer, a new publisher, a new look, and a new design philosophy. But Digital Extremes have made a truly remarkable sequel, one that not only surpasses the original in almost every way, but compliments it in spite of its differences.